December can be a particularly tiring and tiresome month. The days are getting shorter, robbing us all of energy giving daylight. And often those daylight hours available are actually quite dull. AND on top of that we have all the Christmas magic to perform! I know many women who tend to go to bed earlier at this time of the year and certainly for tired minds and bodies, sleep is vital and can have a restorative power. Most of us don’t get the 7-8 hours that we really need to if that’s you, take heed! However, have you ever had a period in time, and perhaps you are in it now, where no matter how much sleep you get, you still feel tired. Every morning? And most of the day? Whether it’s December or August? Obviously there are some health conditions which can cause excessive fatigue so having a check in with your doctor is a wise move. However. Have you ever wondered what else can be causing this endless tiredness and weariness? Well I might know the answer. 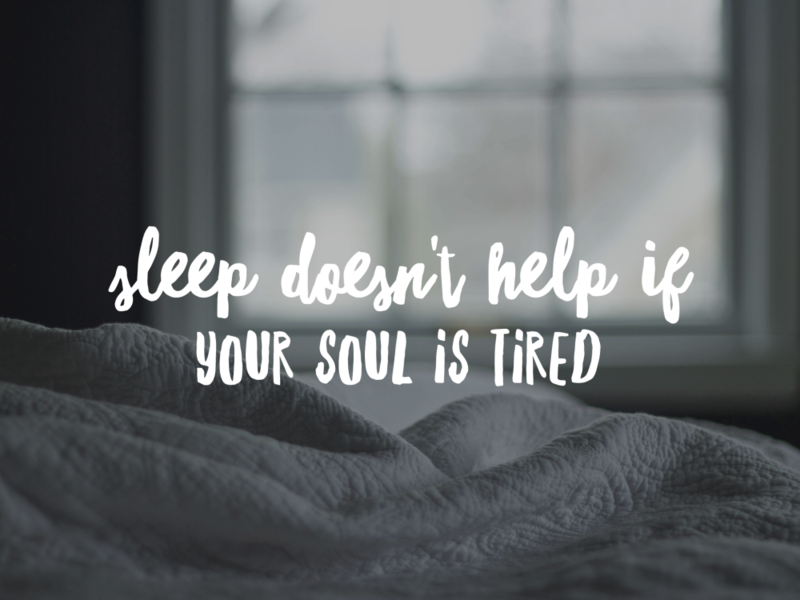 Health issues aside, when a woman is just tired all the time, regardless of sleep routines and vitamin supplements, the problem is generally that it is your soul that is tired. And no amount of extra sleep of vitamin D is going to help that. So, what do I mean by that? Well, your soul is the essence of you, or who you are. And we women are pretty ruthless at putting our souls under fairly intolerable strain at times. We do this in many ways, do any of these sound like you? If you can identify with any of these then this could be the reason for your endless fatigue. And honestly, many women could put their hands up to the whole list. I know that I could have done at one point and there are still some of these I struggle with from time to time. Each of these is sending your soul, the inner you, a negative message. And it’s these negative messages that are weighing you down, robbing you of energy and creating that endlessly tired feeling. Well that would probably take a book to answer! But the first thing is to read a list like this and start to recognise yourself. And then take it one step at a time. For example, look at spending less time with negative people. Tricky if this is a spouse but it can be done in other life areas. In my last job I stopped having regular lunch dates with a negative colleague as I just couldn’t tolerate the negativity and the gossiping. I didn’t do it brutally, I just decided to change my lunch routine to something that didn’t suit her. This had a profound impact on my energy levels and also my feelings about other colleagues that had been constantly in the firing line. You could also start saying no more often. I covered this in ‘all is calm’ in one of the early days. and my best tip here is to practice this with the people you know will be least offended if you say no to their requests. Then work your way up to the more challenging people in time. Another easy one – stop gossiping! this is totally within your control. When I think about which of my friends I like and trust the most, it’s the ones who don’t gossip or talk down about others all the time. It’s a habit that may of us get into, often learning it from our families, or the way our friends behave as we grow up. Conversations and friendships that revolve around talking about other people and what they/ their spouses/ their children etc. are getting up to, in a negative way are really unsatisfying. Just in the way that we remind and counsel our children to ‘be kind’ about other people and ‘if you don’t have anything nice to say, don’t say anything at all’ we should remind ourselves of this too. So try it. Look at this list and also add anything else that might be taking your energy away. And set yourself the intention and a plan to start eliminating these things from your life – I promise you’ll feel lighter.